🔓 Advanced reward options are unlocked on the Marsello Pro Plan. Creating rewards is easy. 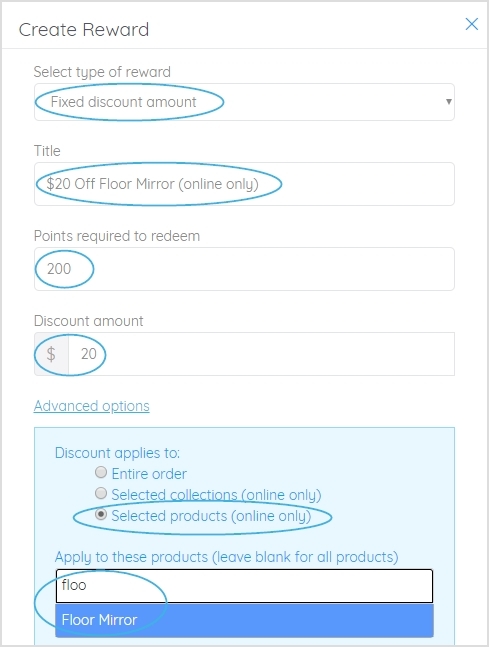 There's no need to create coupon codes - these are automatically generated when a member spends their points to redeem the reward. Coupon codes are unique and only work once. 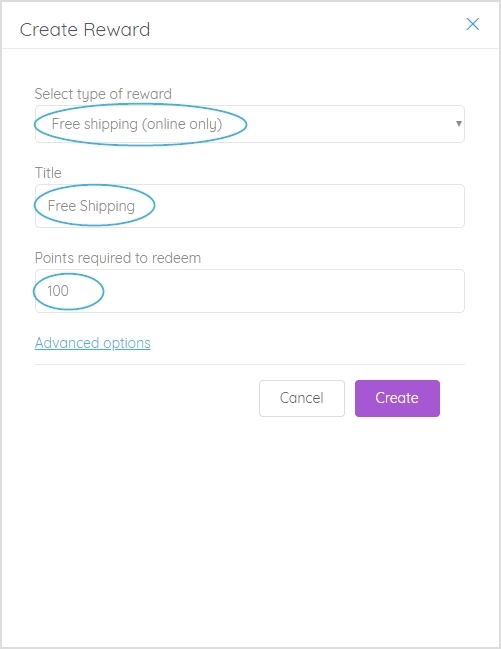 Create your rewards in your Rewards page. ✨ $ off storewide - It’s always nice to get a discount, and offering your members the chance to earn store credit allows them to choose what they spend it on at your store. ✨ % off storewide - Giving your members a percentage discount allows them to choose what they use it on at your store. And it encourages them to spend more to make the most of the % discount. ✨ Free shipping - Encourage your members to make another purchase to benefit from free shipping. ✨ Free product - Giving your members a free product is a great way to thank them for their loyalty. It delights them by creating the same feelings as receiving a gift. It’s also a great way to move idle stock. 📝 Note: This reward type is recommended to be online only. If you want to have it available in-store as well, it requires strict staff training to ensure the item is added to the sale as normal. 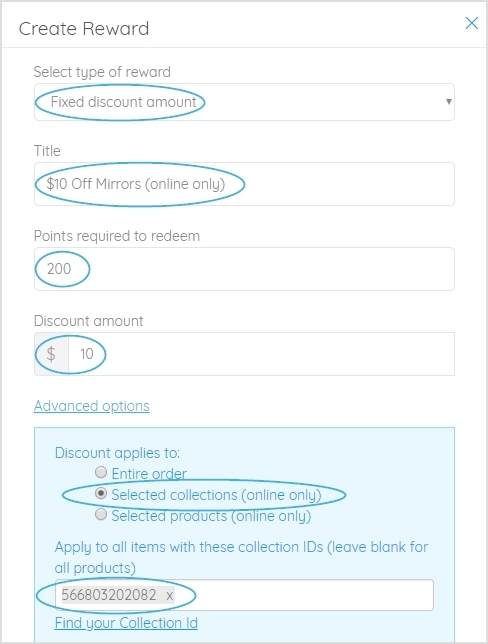 📝 Note: Do not select % off to create a 100% off discount, as this will mean that if the member adds the item to the cart multiple times, they will get them all for free. ✨ % off specific product - A % discount off a specific product is a good way to move idle stock. This discount will apply to the entire product quantity. 📝 Note: This reward type is recommended to be online only. If you want to have it available in-store as well, it requires strict staff training to split the sale into two sales if the member is making additional purchases. The reward should only be redeemed on a sale that only contains the relevant products. 📝 Note: When stock of this product runs out, you'll need to remember to update this reward. ✨ $ off specific product - A $ discount off a specific product is a good way to move idle stock. This discount will apply across the entire product quantity. 📝 Note: This reward type is recommended to be online only. ✨ % off product collection - A % discount is a great way to introduce your members to a specific product line, inspiring them to buy more in the future. This discount will apply to all products within the collection. Under Advanced options: - On BigCommerce, type in the specific product categories that the reward applies to- On Shopify, add the collection ID's of collections that the reward applies toHere's how to find a collection ID in Shopify. ✨ $ off product collection - A $ discount is a great way to introduce your members to a specific product line, inspiring them to buy more in the future. This discount will apply to all products within the collection. Under Advanced options: - On BigCommerce, type in the specific product categories that the reward applies to - On Shopify, add the collection ID's of collections that the reward applies to - Here's how to find a collection ID in Shopify. 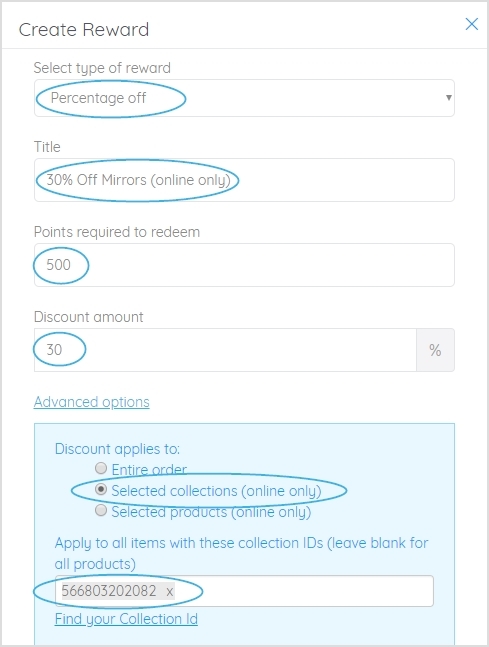 ✨ % off spend threshold orders - A % discount that can only be used on orders over a specified value is a great way to encourage members to spend more to be able to get the discount. 📝 Note: This reward type is recommended to be online only. If you want to have it available in-store as well, it requires strict staff training to ensure the sale is over the spend threshold. Under Advanced options - Only apply if order subtotal is greater than: Type the $ amount reflected in the title. 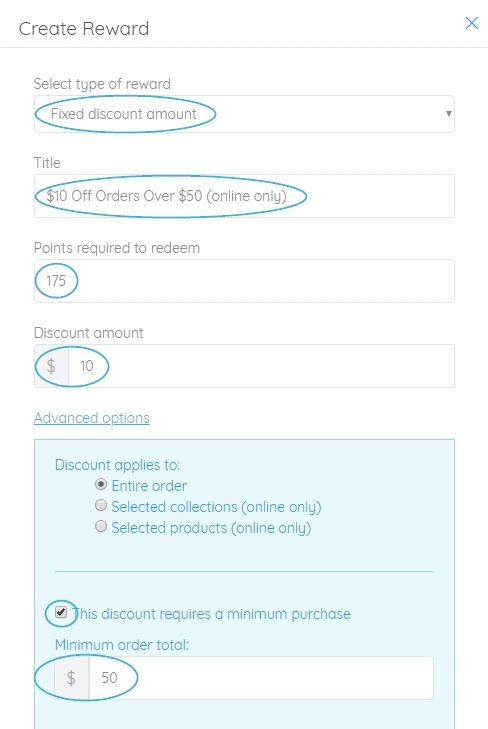 ✨ $ off spend threshold orders - A $ discount that can only be used on orders over a specified value is a great way to encourage members to spend more to be able to get the discount. How does the reward ladder work? 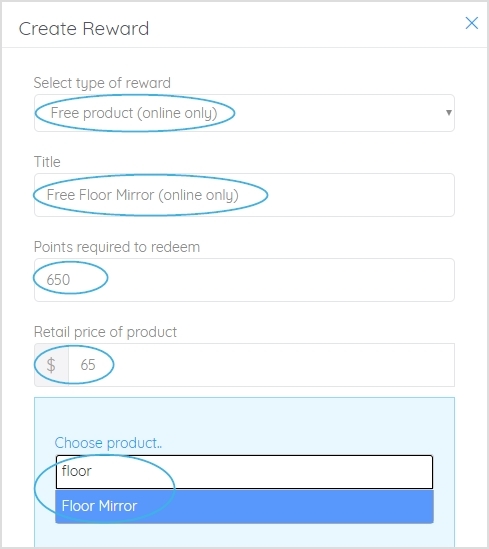 Your reward ladder entices your customers to join your loyalty program and encourages them to shop and earn points to spend on your rewards. 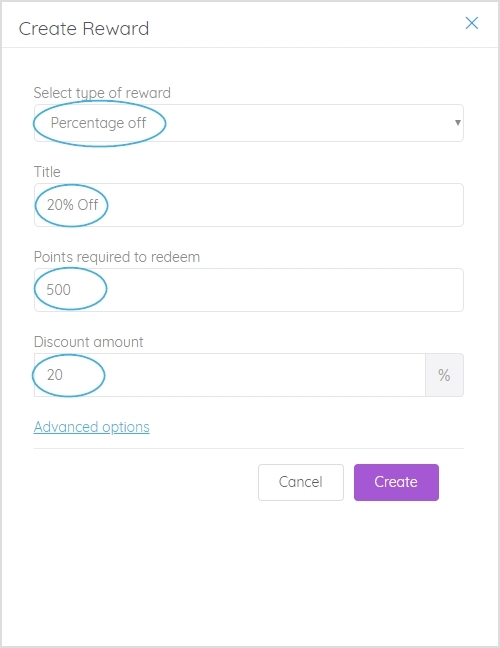 When a member has earned enough points, they can spend them to redeem a reward or save their points up towards a reward at a higher points cost. You can read more about how the reward ladder works here. Do I need to create coupon codes? 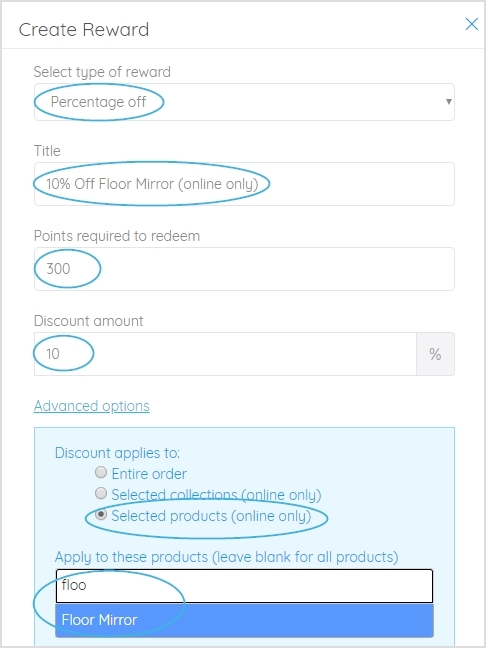 When choosing your points to redeem amount, it is recommended that you use the '10% of dollar spend' rule, i.e. 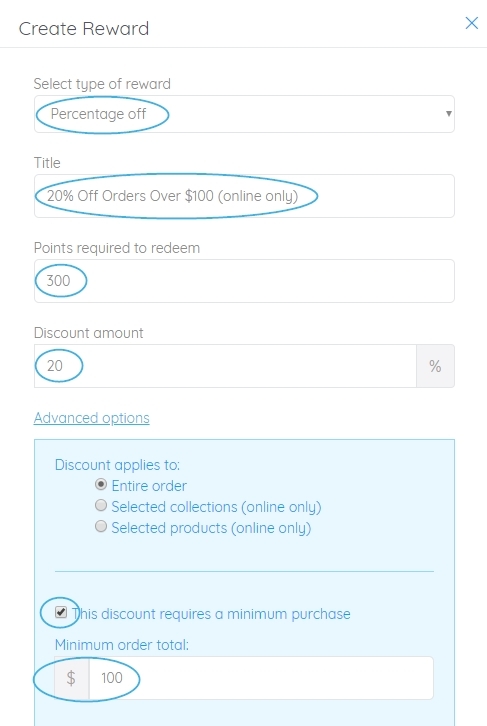 your reward discount amount is 10% of the spend required to earn this number of points. When creating loyalty rewards, it’s important to be sure you also include the relevant terms and conditions. Whether it's to encourage fair use or protect your store, outline exactly how and when your rewards can be redeemed ensures that your rewards are used as you intend them to be used. > How to add terms to your loyalty rewards. Create three or more rewards to encourage members to earn more and more points to spend on your rewards. A rewards ladder gives your members more flexibility to choose which rewards they would like to earn points towards and redeem. Loyalty programs with 3 - 5 rewards show better results than those with 1 reward, i.e. their members are more engaged with their loyalty programs, their reward redemption statistics are higher, and their member spend is greater. Read more about how your reward ladder works. 💡 Top Tip: If you’re stuck for ideas, don’t be afraid to try a few different ideas, see what works the best, and then add some different ones to replace the rewards that aren't performing as well.